I went to the Big Outlet Sale last April and was able to score my 3rd pair of Melissas. Apparently, the sale is happening yet again this September. Is it just me or does the Big Outlet Sale seems to come more often than I’d like? I dunno. I think that when BIG sales come so often, it doesn’t feel that special. Also, I don’t get a lot of jaw dropping steals. For BPI, I suggest putting stickers or posters on the SELECT merchants where shoppers can avail of the additional discount. It will make your cardholders feel special. Frankly when I was there, the only “perk” I got was the free entrance and that didn’t make me feel any special. 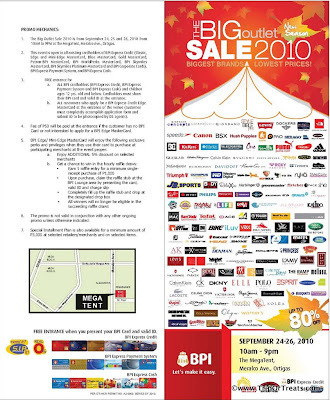 September 24-26, 2010 from 10AM to 9PM at The MegaTent, Meralco Ave., Ortigas. Free entrance for BPI cardholders and P50 for others.